Families everywhere struggle with what their yearly family Christmas Card is going to look like. But a New York wife refused to let her husband’s deployment in Afghanistan keep them from sending one out this year and their picture has now gone viral. In the photo (seen above) Sgt. Daniel Purdue is on the left. His wife Christina on the right. 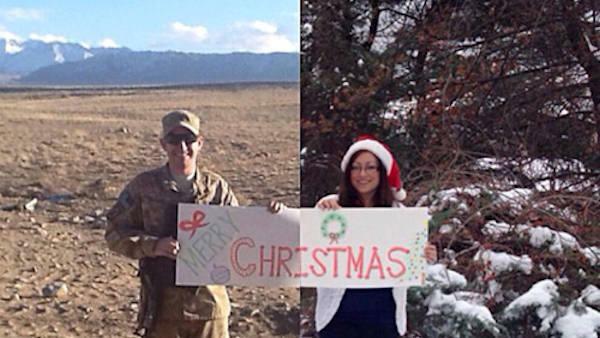 He’s standing in Afghanistan, she is in Westchester County, New York. But with a little editing and camera magic they are together and their Christmas card proof that they are united in their love. Daniel spoke to Eyewitness News via Skype. “We just wanted to show that no distance can get in the way of love and we wanted to show the support of our brothers and sisters in arms, and that nobody forgets them this holiday season,” said Daniel. It was all Christina’s idea. The couple is married 3 years and this is their first Christmas apart. “We wanted to come up with something really good,” said Christina. Chirstina found the idea for the card online. Mailed the board with the Christmas greeting on it to her husband, and then told him where to pose for his half of the picture. The result, viral gold. “Our family loved it, all our friends love it, everyone has been sharing it all across the internet,” adds Daniel. They are almost 7,000 miles apart this Christmas, but these two high school sweethearts want everyone to know their love knows no bounds. “We wanted it to go viral so it could get overseas and we can tell our soldiers that we appreciate them,” adds Christina. This is Daniel’s third tour. He is scheduled to be home in January. I, my, we, and our.